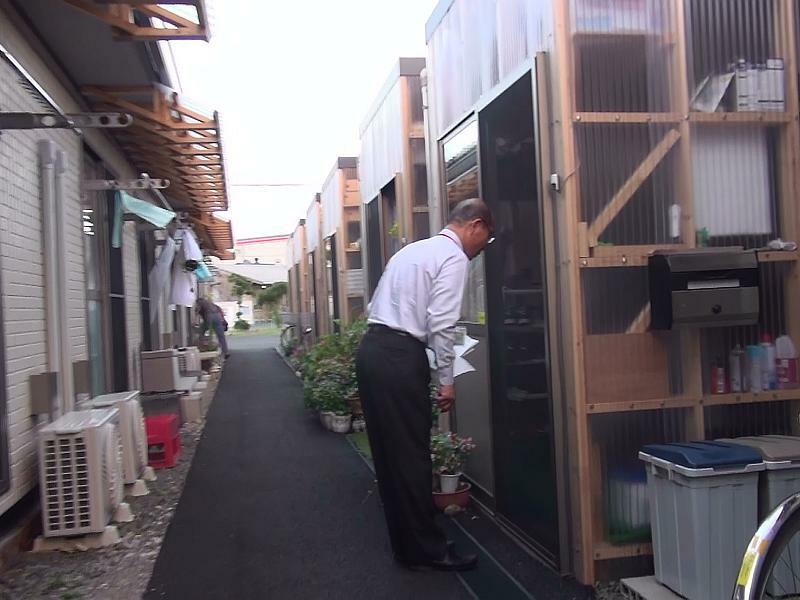 Temporary housing complexes are found all along the tsunami coast. 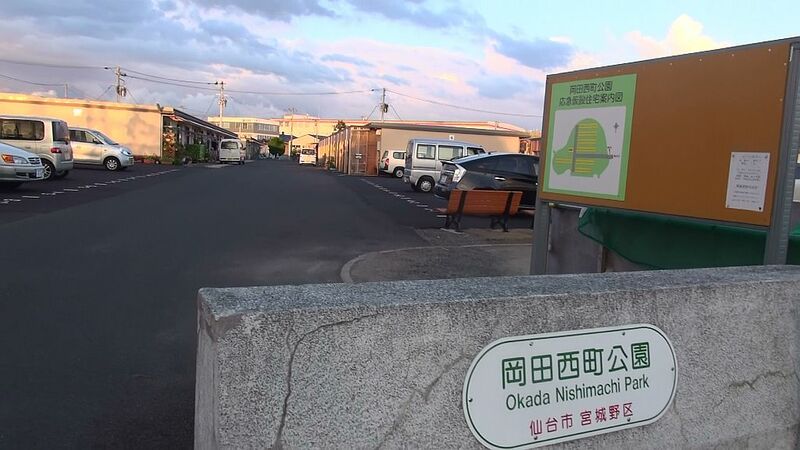 This one is Okadanishimachi, southeast of Sendai City http://ameblo.jp/okadanishi/ . Expectations are it will be there for 3 years, although if the Kobe Earthquake is anything to go by, that will be extended. Each complex varies in size and scale. 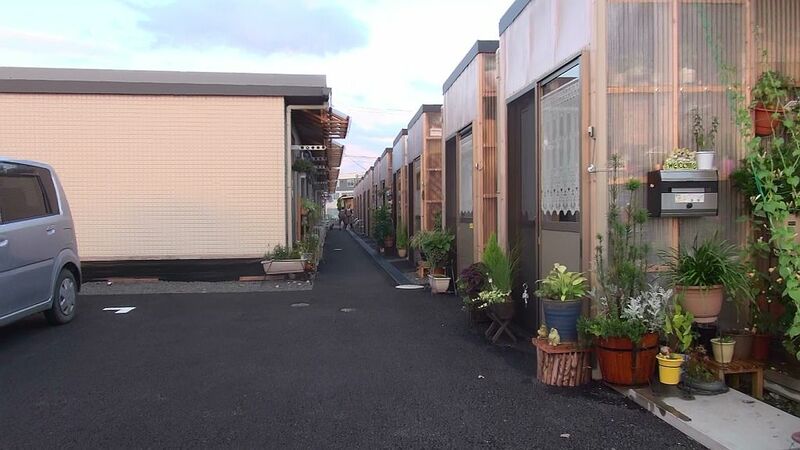 Okadanishimachi comprises of 80 units in 7 blocks plus a community centre. 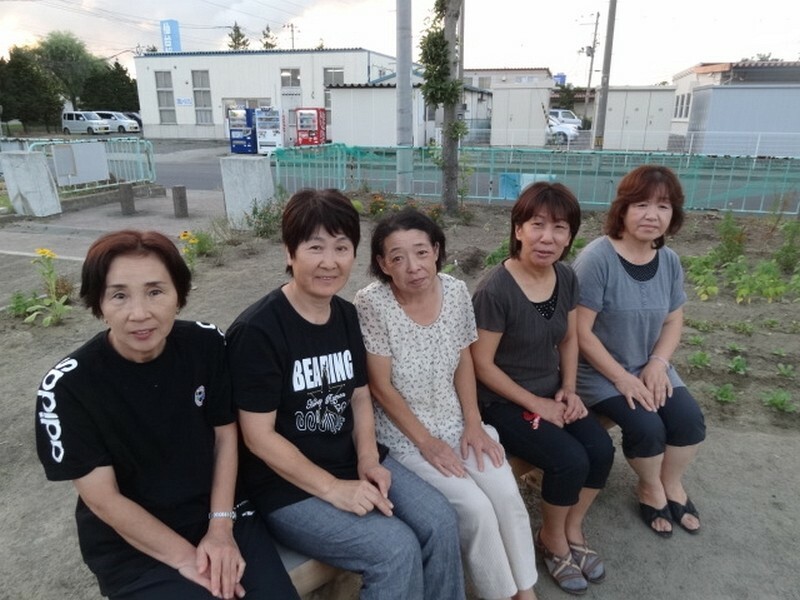 Some of the residents of Okadanishimachi outside their community centre! 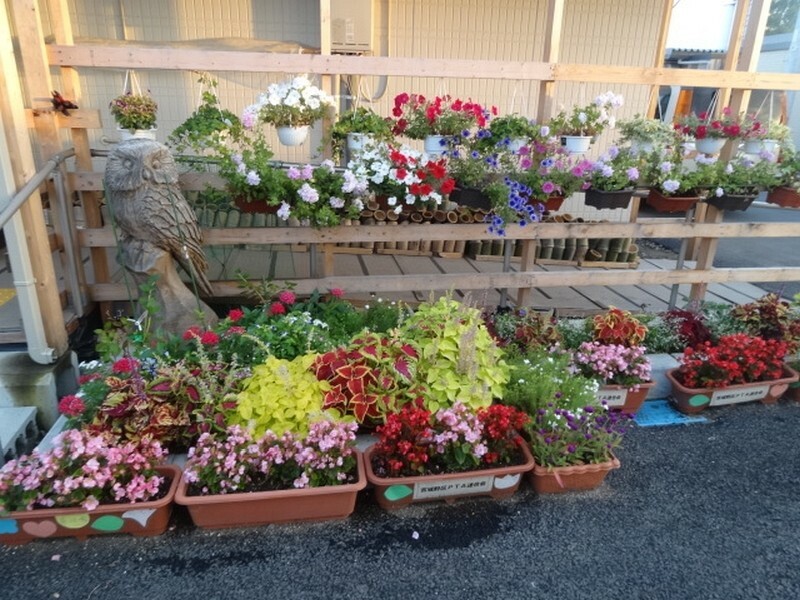 Akemi has grown plants and flowers outside the community centre (below) and her unit, which is like a jungle! Akemi says she also made the wooden sculpture of an owl – using a chainsaw. I think I believe her! Narrow alley between accommodation blocks. Some of the blocks are separated by only a narrow alleyway. It reminded me of the terrace houses where I grew up in North West England. The rows of dwellings made Tada wonder if this was like the communal villages during pre-historic (Jomon?) times. Each unit has a lounge, bedroom and kitchen, plus separate toilet and bathroom. Bedroom in the middle and …. Well appointed kitchen at the other end (bathroom and toilet to the left). Up to 4 people reside in a unit, although it becomes a little cramped with that many! Residents comment that noise from neighbouring units can sometimes be a problem. Gas is the energy source for cooking and showers. If outside during the peak use time around 5 to 6:00pm, the fumes from the exhaust is quite overwhelming. Official looking men came round with clip boards, who seem to be inspecting things. What things I don’t know. An official looking man paying a visit to a resident. Although I was there only a short time, and perhaps I am wrong, but I sensed a kind of special spirit amongst residents. I wonder if it is similar to the “wartime spirit” that my parents’ generation talked about? Perhaps it is something that has been rediscovered through adversity – that people are all in it together regardless of their circumstances. Perhaps it’s something that was lost in the privacy of modern living. Residents enjoying a warm summer evening with their vegetable garden in the background. My first encounter with the residents was to be presented by Akemi to a group of about 30 ladies in the main room of the community centre. It was quite frightening! Cheessy grins! Koji-san (centre) autographing the book he gave me, with friends. Next was to meet a drinking party of some of the men from the complex. I had seen a pictorial book of before and after aerial photos that I wanted to get. They didn’t know I wanted it but during the conversation Koji-san decided to give me his copy. It is rude to say “no” in these situations so I reluctantly accepted it. Relaxing in the community centre. 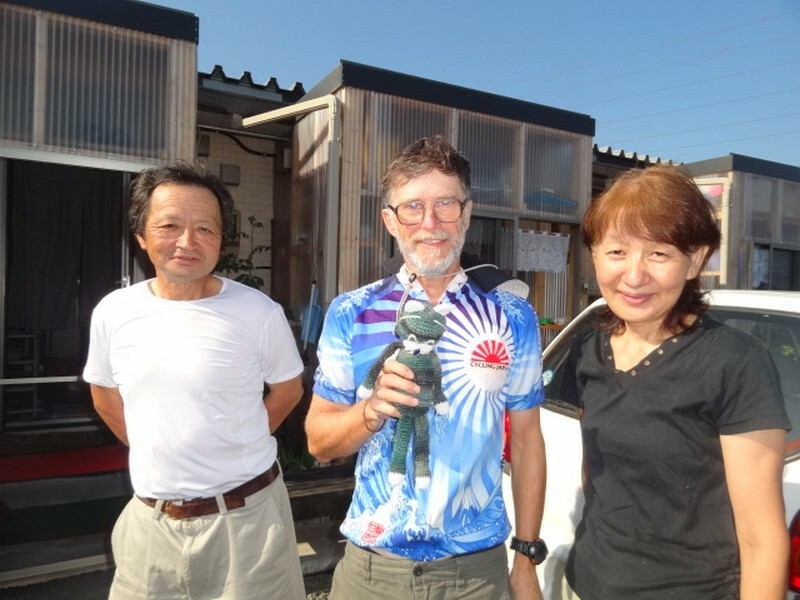 With Shouichi and Youko outside their “home”. Youko-san kindly made me breakfast and lunch during the days I volunteered. She also gave me a soft toy she made specially (in photo). 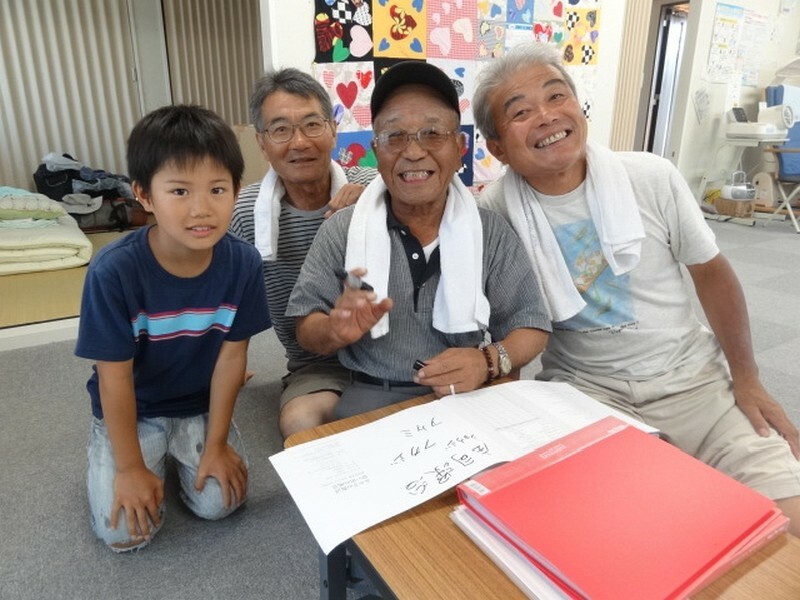 Shouichi-san was the waiter and brought the morning wake-up call! 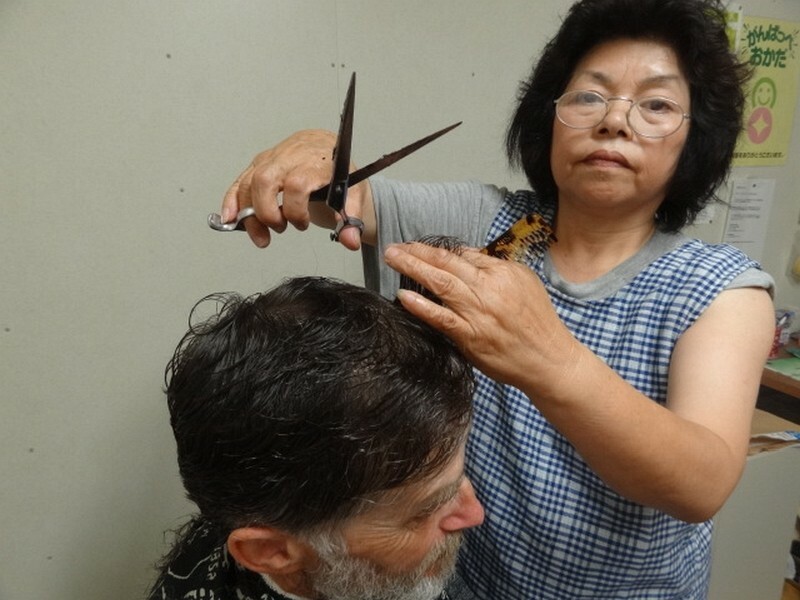 Hair cut time with Hisae! 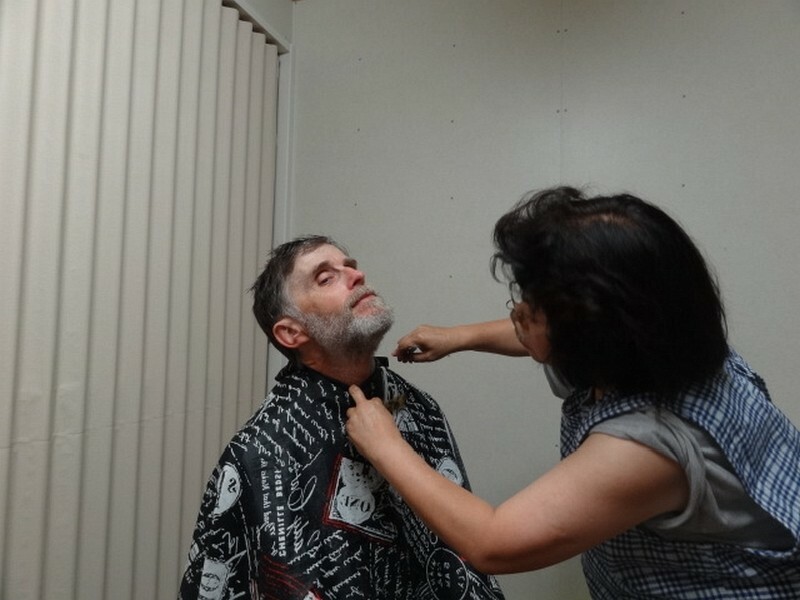 My hair had become quite long while travelling through Japan and needed cutting. 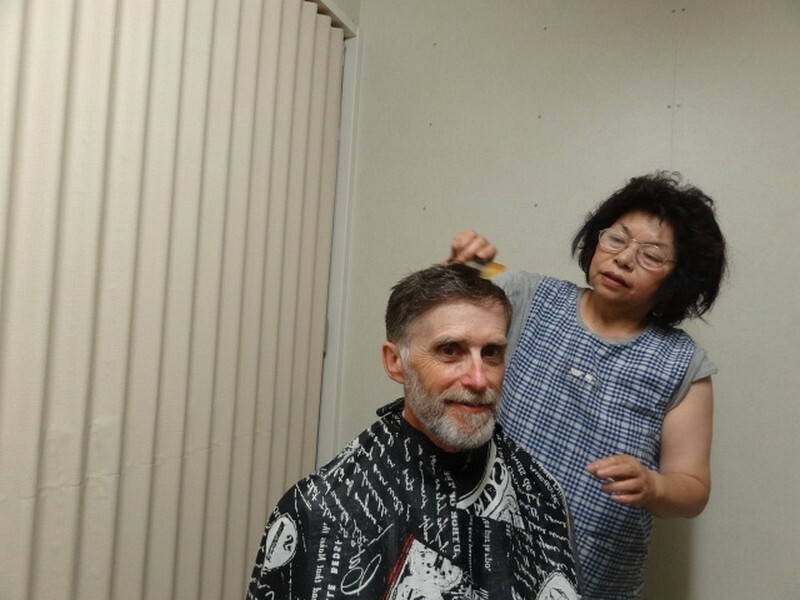 Having been offered a haircut I was procrastinating about it when in walked Hisae with her scissors and comb. Before I knew it, it was snip, snip, snip! Hisae and her husband were about to get their house back, being one that had survived and recently restored. See the Other Volunteers page. Thank you to all the World from the residents of Okadanishimachi! 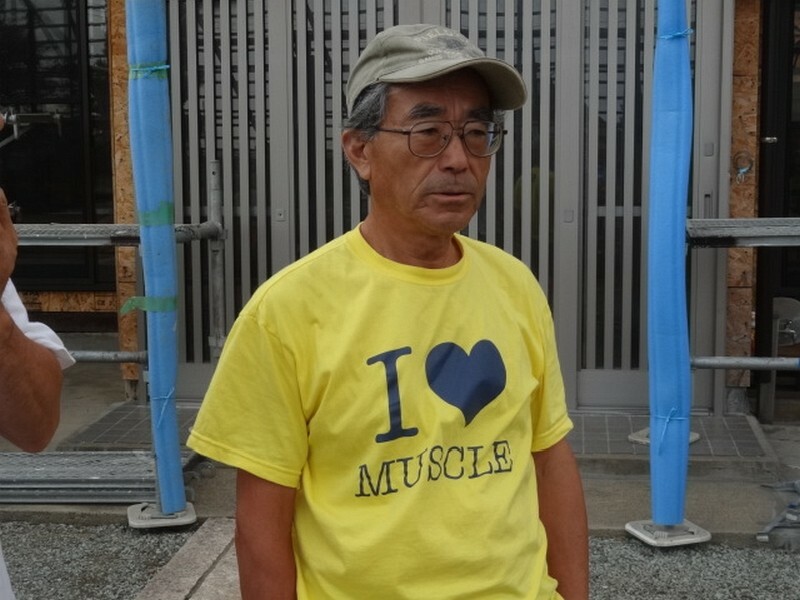 A few words from Mr President – “I love muscle”! 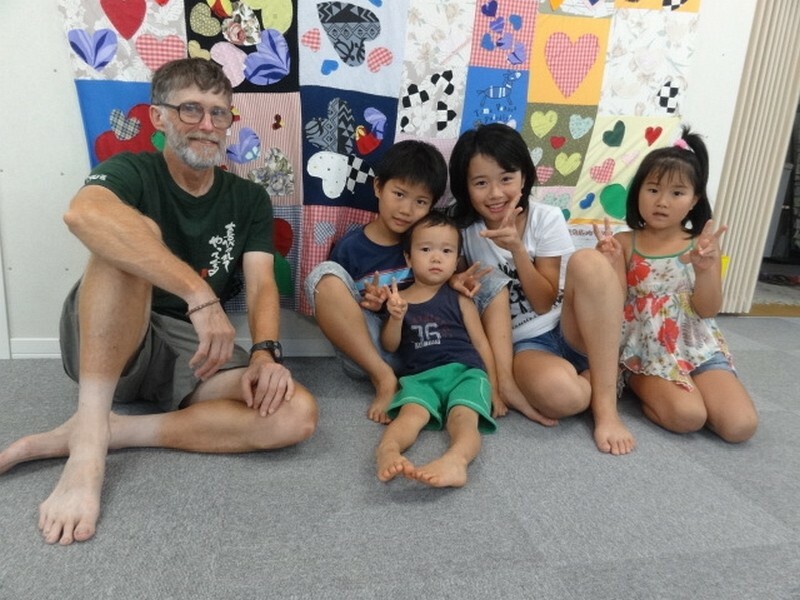 Akemi’s Dad and “President” of Okadanishimachi Temporary Housing Complex. Akemi is the 18th generation of her family who have lived in Gamou, the settlement adjacent to Okada. Even longer than the nearby shrine. Through a little luck their home is one of those that escaped the worst and is being restored.